Seriously - what is up with that signature? Did he dot two I's in a row? His name doesn't even have the letter "I" in it. Are those umlauts? When did Spanish names start using umlauts? Maybe a hidden Y? Sort of like a silent E, but just not shown except in cursive? 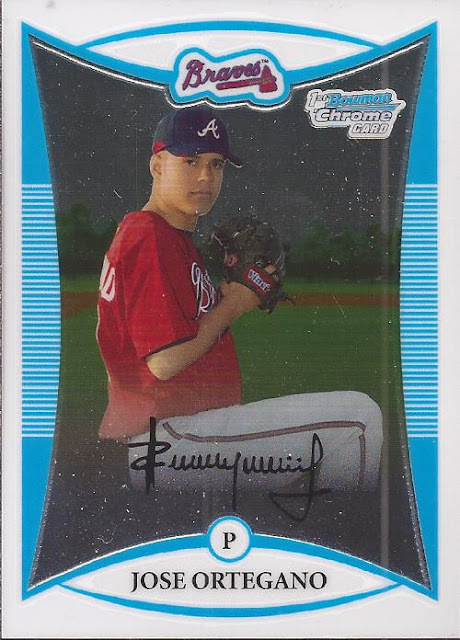 Go figure that this is a Braves card. This one would make a great Wacky card. Wow! Maybe it's an error? Another palyer's signature, although I can't imagine who could have a name like that, whaterever it is. What's that first capital letter supposed to be anyway. It looks like a musical notation. I'm not sure what is going on with this, but it's awesome! Good catch! Those letters definitely don't match up, I tried looking up his actual signature and I can not find anything to compare. I have no idea whose signature that is... but at least it has a little flair compared to some of the lazier autographs out there.